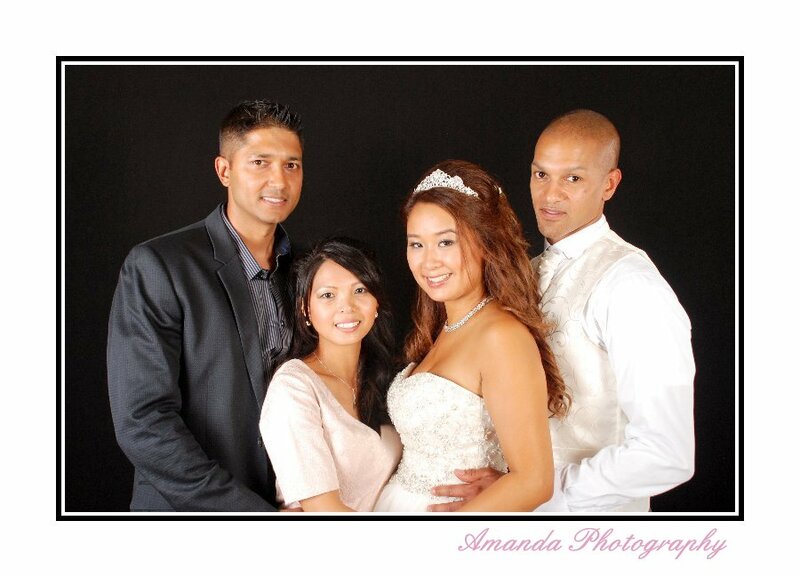 Studio Quality Photographs for Wedding Receptions in Surrey and all over the UK. I offer a unique Photo Studio service that provides a superb personal gift for your guests to go home from your wedding reception with. The studio will become a centre point at your wedding reception as families gather for family portraits and friends enjoy posing with each other. We set up a mobile photo studio comprising of a professional backdrop, studio lights and photo quality printers. Your guests are photographed in fun and flattering poses in singles, couples or family groups. After being photographed all images are viewed immediately on the viewing station and then printed in seconds for the guest to take with them. 1. Attend with the studio, photograph guests and give away free prints for a period of three hours. 2. As above but instead of our 'Almost unlimited' prints, we sell you a minimum of 50 vouchers at a discounted rate. Guests can then purchase further images on the night at full price or use the voucher towards a larger print. This package ensures a much fairer use of the studio and encourages all guests to have their photo taken. 3. You pay us to attend your Wedding Reception and guests purchase prints on the night. After we have completed your Wedding reception Photography, we will supply you with a CD containing all of the images we print on the night in a size suitable for use on Social Media websites. Please do not confuse us with a Photo Booth. We offer high quality photography and poses which are suitable for all age groups. Ask yourself if your Grandparents would prefer a photo taken squashed into a Photo Booth wearing a Pink Cowboy Hat and Feather Boa or a High Street quality Professional Photograph which can be cherished for many years. We offer this service for any wedding reception. You do not have to book us to photograph your wedding day.